Raise your shoulders or legs for a better night’s rest. Elevated position helps breathing or digestion. 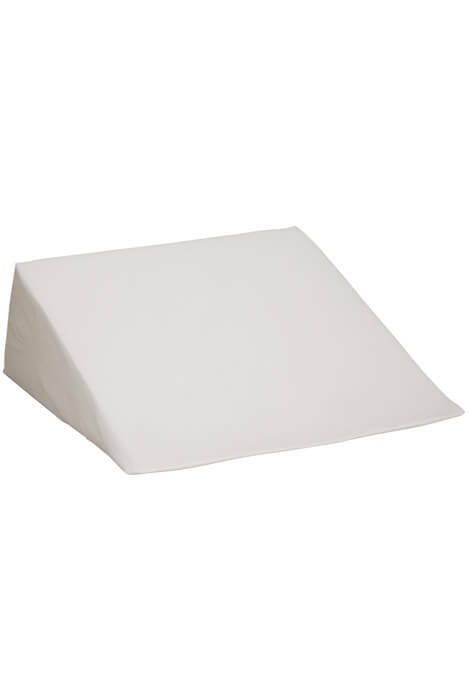 Use wedge support pillow XL alone for firm support, or top with your pillow for added softness. 100% polyurethane foam. Cover is 100% polyester. Express shipping not available on wedge supports. All wedge pillows are 22 1/2" long x 22 1/2" wide. Small wedge is 7 1/2" high; Medium wedge is 9" high; Large wedge is 12" high. By LivingSURE™. Imported. I was worried about this being so soft that it wouldn't seem as if it was even there, like foam mattress pads, but it is so hard I had to put pillows over it to be able to sleep on it. I'm going to try putting it under the mattress. Don't buy this for anyone with osteoporosis. It will hurt their bones. The cover is slippery and pillows and your body slide right off. Got charged for it but have NOT recieved it yet! I'm sending back this item. It's not comfortable at all. Not comfortable at all. Dr through it would help. First of all i used to have a very good wedge it was a diffent type and style then this one this wedge is bad all the way around don't waste you money. It does keep it's shape, unfortunately, it is too firm to be of much use for me. I wanted to elevate my head to help my snoring but I find my back hurts when I do so. I am still experimenting to see if it will help me in the end. What is the degree of decline of this pillow? BEST ANSWER: Thank you for your question. All wedge pillows are 22 1/2" long x 22 1/2" wide. Small wedge is 7 1/2" high; Medium wedge is 9" high; Large wedge is 12" high. We hope this information will be of help to you.